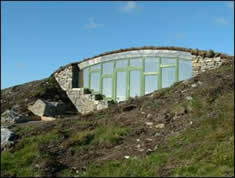 Eco or earth sheltered homes are energy efficient homes that maximise existing surface space and minimise energy costs. Conservative estimates place running costs of earth-sheltered homes at 50% less than conventional above ground housing. Earth sheltering uses a combination of light, space and vegetation to their full advantage. Polarwall’s part in this process, allows the retaining wall & superstructure to be built quickly on site, providing all the necessary structural and thermal requirements to the building. 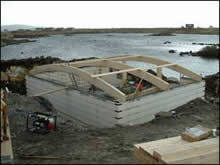 Using traditional building techniques such as ply formwork, or conventional block work, can prove time consuming and an expensive way of forming the structure, particularly for one off developments such as earth sheltered houses. As with basement construction, Polarwall uses its insulated shuttering panels to incorporate concrete and steel reinforcement. Typically the walls of a dwelling, 150m in area, will take no more than a week to assemble. Earth sheltering may cost a little more initially, but there are big savings in the long term. The easiest method is to build into a hillside, so that three sides and the roof of the building are buried, while the fourth side is mostly glass to offer maximum sunlight and solar gain. Sustainability is the key, Polarwall aims to combat this by building a sustainable infrastructure in order to effectively adapt to the environmental changes that are happening now. Using Polarwall to construct the shell of an earth-sheltered house provides this by generating low energy homes with a greater life span. At Polarwall, we believe earth sheltered dwellings work with nature, either by covering the building in earth, so that the roof can be turned into a garden, or by sinking the main structure below the skyline so that the landscape above is unspoiled.